On Friday 7th December the Castle Guard (Hradní stráž) celebrated its 100th anniversary. About 500 servicemen commemorated the formation of the unit during a solemn ceremony held on the 3rd Courtyard of the Prague Castle, attended by many important guests including President Miloš Zeman, supreme commander of the armed forces. On Sunday 9th December in an interview for the Russian television NTV President Miloš Zemena said anti-Russian sanctions were useless and the EU had no strong leader when compared to those in Russia, China or the U.S.A. Zeman repeated his opinion that the sanctions imposed on Russia by the EU following the occupation of Crimea were damaging both sides politically and economically, and should be ended, possibly with support by Italy and the countries of the Visegrad group. President also said he did not believe in the possibility of a military conflict between NATO and Russia. Czech Republic has withdrawn from the Global Compact on Migration, and was not among 164 states which signed the pact on Monday 10th December in Marrakesh, Morocco. The Governement said earlier there were ambiguities in the interpretation of the document, especially it does not differentiate clearly between legal and illegal migration. Czech Republic has joined other countries who refused to sign the pact including Hungary, Poland, Slovakia, Austria, Australia and the U.S.A. The number of Czech soldiers supporting the European Union Training Mission in Mali (EUTM) has been increased to a total of 120 personnel. The newly expanded unit is assigned to protect the Koulikoro Training Centre (KTC) and its occupants. The soldiers are also responsible for escorting the EUTM convoys and carrying out patrol activities in and around Bamako. The unit is part of a joint Czech-Spanish KTC battalion. According to a poll conducted by the CVVM agency, the Army and the Police of the Czech Republic enjoy a high level of public trust, both reaching a 67 percent trust rating. The judiciary system got a 58 percent trust rating, followed by banks at 52 percent. Television has reached 40 %, NGO’s 37 % and the churches 25. Airbus and its partners have completed the design definition phase of the European medium-altitude long-endurance (MALE) remotely piloted air system (RPAS), with the announcement of the successful conclusion of the preliminary design review (PDR) on 13th December. The project has been joined by the Czech Republic in November. The Ministry of Defence has officially begun the tender for 210 Infantry Fighting Vehicles (IFV) at a projected cost reaching over CZK 50 billion (USD 2.6 billion), the largest public contract in modern history of the Czech Republic. 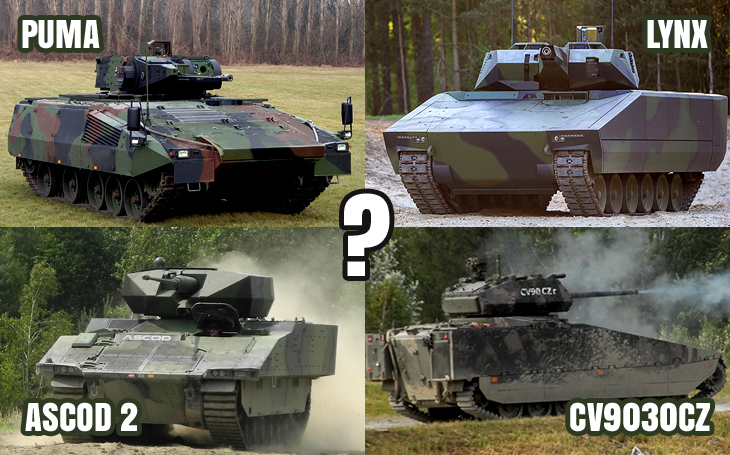 Minister of Defence Lubomír Metnar will brief the cabinet about the potential candidates today; four companies were selected earlier: PSM (IFV PUMA), Rheinmetall (IFV LYNX), GDELS (ASCOD 2) and BAE Systems (CV9030CZ). The constract might be signed in August 2019.